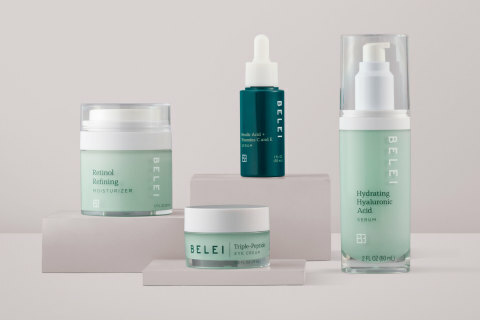 Amazon (NASDAQ:AMZN) today announced the launch of Belei, a line of high-quality skincare products that offer solutions for various skin types and feature ingredients with proven effectiveness. The collection has 12 different items, including everything from retinol moisturizer to vitamin C serums, to help customers address common skincare concerns like acne, the appearance of fine lines and wrinkles, dark spots, dehydration, dullness and more. All Belei products are free of parabens, phthalates, sulfates and fragrance and are not tested on animals. Belei product bottles are made of post-consumer recycled resin and carton packaging is 100% recyclable. "Our goal is to help customers spend less time and money searching for the right skincare solutions," said Kara Trousdale, Head of Beauty for Private Brands on Amazon.com (News - Alert). "We took a simple, no-nonsense approach when creating Belei, developing products with ingredients that are both proven to deliver results and also offer customers great value for the quality." Oil-free micellar wipes that gently remove makeup, dirt, and complexion-dulling impurities. A revitalizing clay mask made with charcoal that leaves skin feeling clean from deep within, and advanced hyaluronic acid to help retain moisture. A lightweight, oil-free moisturizer to help preserve and protect skin. Contains an advanced formula of fast-absorbing sunscreen for non-greasy daily defense. A lightweight, acne-fighting formula to help fight blemishes. Apply at the onset of breakouts for maximum effectiveness. A lightweight serum that helps to even pigmentation and lighten the appearance of dark spots caused by acne. Use directly on areas of concern or all over to help even skin tone. A lightweight, tri-peptide blend eye cream with hyaluronic acid, caffeine and aloe vera to help minimize the appearance of fine lines, puffiness and dark circles. A silky, lightweight serum with the clarifying power of vitamin C and hyaluronic acid that leaves skin feeling hydrated and refreshed. This moisturizer blends vitamin C and hyaluronic acid with a botanical complex that helps smooth skin with daily use. A refining moisturizer that uses the latest technology in retinol delivery to release vitamin A to the skin over the course of the day or night. A botanical complex soothes skin, while squalane and hyaluronic acid help skin appear smooth and refined. A silky moisturizer that contains a high level of an advanced formula of hyaluronic acid. Blended with squalane and glycerin, it locks in valuable moisture for hours to keep skin feeling smooth and refreshed. This serum is a multi-tasker that tackles a multitude of skin needs in a single serum. A long-lasting blend of five specialized hyaluronic acids helps retain moisture, while reducing the appearance of fine lines. This serum helps to purify and refine the skin, blending the antioxidant powers of ferulic acid, vitamin C and vitamin E. Combined, these ingredients help even skin tone and leave skin feeling hydrated and refreshed.